The Liebherr Components division and Magni Telescopic Handlers Srl, a leading manufacturer of rotating telescopic handlers based in Modena (Italy), have signed a contract for the delivery of drives for Magni machines. By doing so, Liebherr introduces its three-stage slewing drives to the telehandler market and, thus, provides for higher precision and stability of RTH machines. The most common application for telehandlers is to move loads to and from places unreachable for a conventional forklift. The machines have to stop the load in an exact position and to remain stable there. The Liebherr system solution consists of a backlash-free drive of the type DAT 200, a hydraulic piston motor with high pressure and rotation speed as well as special breaks. The system ensures higher precision and stability of the machines and allows to work safer at larger heights. This is possible due to the three-stage slewing drives, which, as compared to one-stage drives, provide for a smoother movement of the boom. Moreover, Liebherr has long-term experience in gear technology, for example for fireworks machines with operational heights of 64 meters. "The optimised gear quality is backlash-free and offers higher precision in the positioning of loads", explains Enrico Menozzi, Head of Sales Drive Technology EU. "This helps our customer to place the boom exactly where it is needed", continues Menozzi. 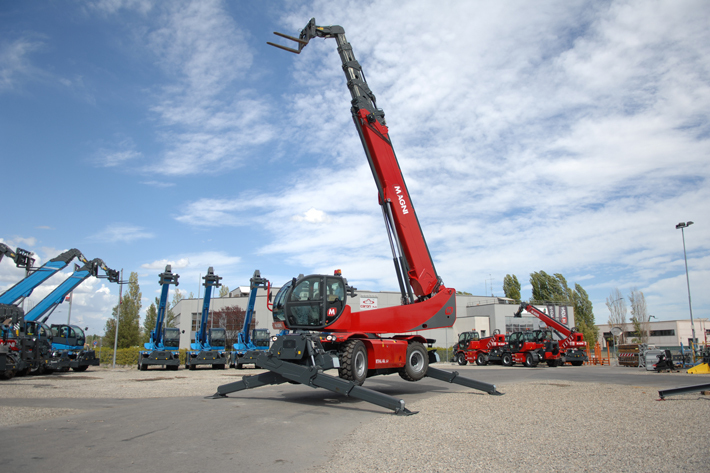 A family-owned Magni Telescopic Handlers Srl is a market leader in the production of rotating telescopic handlers with over five years of experience. Magni RTH machines lift loads up to 46 meters, which is the world's largest operational height for similar vehicles at present. The machines with the operational height between 26 and 39 meters are the first to be equipped with the Liebherr drive solution. "As a manufacturer that always aims at equipping its machines with the most innovative, modern and reliable components, we are very proud to have such a co-operation with one of the word best manufacturers of machinery and components. This new slewing drive grants to our machines a much higher precision and smoothness during rotation as well as high precision when it stops. Indeed, the possibility to have components by such a manufacturer can only increase our quality on the market", says Eugenio Magni, Product Manager for Magni Telescopic Handlers Srl. Liebherr schedules the series production for the second half of 2018. The next to come are the drives for the RTH 6.46 SH machines with the currently highest operational height.